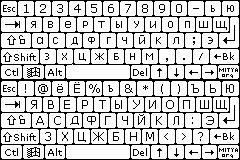 Russian Phonetic Keyboard for Windows Mobile phones. I was extremely surprised to not find any sort of Russian alphabet support on my Windows mobile devices. Since there were no free utilities available for this basic function on Pocket PC, I wrote a new driver for this to be used freely. No warranty is provided – this works well on my Sprint Touch (HTC 6900) and few other phones but I have not tested this extensively on many devices. Does not work with real keyboards – touch screen operation only. Please contact me if you need the source code.